Japan, a world leader in earthquake engineering, has been paralyzed by a series of giant waves that followed one of the most violent earthquakes in a century. Residents of the port town of Kamaishi in Iwate prefecture watch in horror as the first huge tsunami waves sweep away cars and buildings. Although the magnitude 9.0 quake on Mar. 11, 2011, apparently did not collapse high-rise buildings, the ensuing tsunamis flattened vast areas along the northeast coast. The death toll is swelling steadily as bodies wash in on the surf, and citizens and Japan’s Self Defense Forces scour a landscape turned upside down by inconceivably powerful waves. Shortly after Japan stopped shaking at 2:46 pm local time on Friday, March 11, we began hearing about troubles at a series of nuclear plants. After the reactors automatically shut down during the quake, emergency systems for removing heat still being generated in the reactors were routinely switched on. But because the electric grid was down and the standby generators were damaged — perhaps by seawater — the emergency cooling failed. 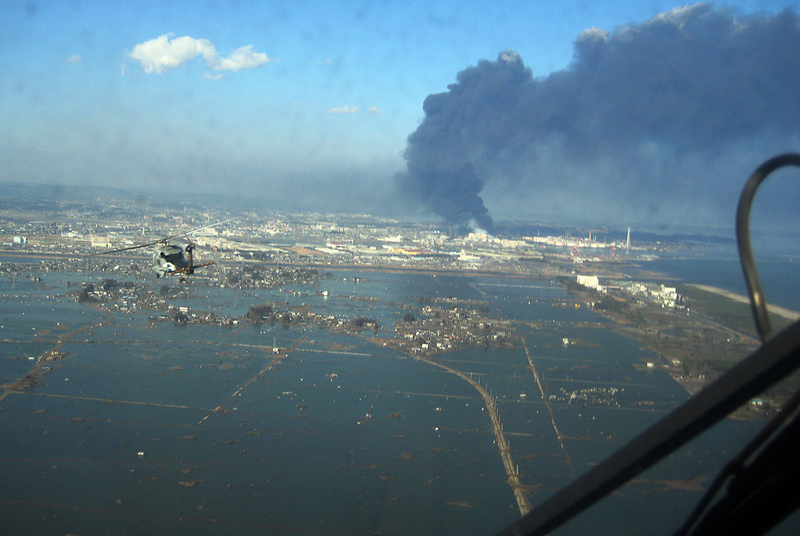 By Tuesday, March 15, three reactors had exploded, a fourth was burning, radioactive material was airborne, reactor workers were being evacuated, electricity was growing short in Tokyo, and the crucial containment vessels were under severe threat if not already breached. With the first nuclear meltdowns since Chernobyl, in 1986, under way, global stock markets were crashing. A helicopter flies over the city of Sendai, as it delivers more than 1,500 pounds of food donated by citizens of Ebina City, Japan, to survivors of the earthquake and tsunami. As Japan licks its wounds, The Why Files wants to know what causes tsunamis. How do they travel across the ocean? How they have impacted coastal people through history? Can we reduce our vulnerability to nature at its most cataclysmic? Movement of the sea floor translates into waves at the surface. Although landslides and volcanoes cause some tsunamis, probably 95 percent result from underwater earthquakes that contain a strong vertical motion. Such quakes often occur where one of Earth’s tectonic plates dives, or “subducts,” beneath another. Masterlark, who has studied the giant, 2004 earthquake and tsunami in Sumatra, says the magnitude 9.0 earthquake in Japan likely broke a fault stretching at a shallow angle from the sea floor roughly 150 kilometers beneath Japan, along a trench several hundred kilometers in length. To imagine how vertical movement of the seafloor causes a tsunami, imagine making waves by throwing a stone in a pond. Even though earthquakes disturb the bottom of the water, the analogy works: just as a larger stone, thrown faster, makes a larger wave, the size of the tsunami depends on extent and speed of the ocean-floor movement. The tsunami is usually most intense close to the earthquake: as waves spread from the epicenter in a typical arc-shaped pattern, their energy also spreads out. 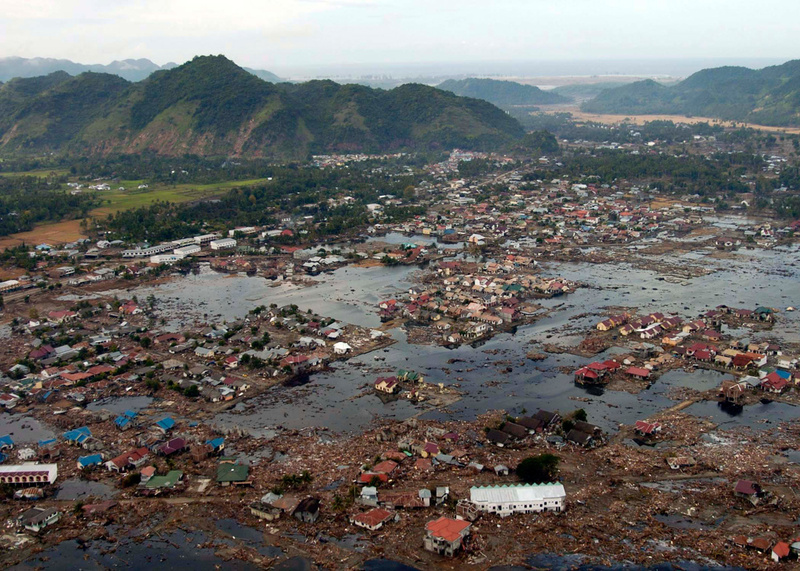 A ruined village near the coast of Sumatra after the 2004 tsunami. One factor that distinguishes tsunamis from more familiar waves is their extreme wavelength. On the open ocean, the peaks of waves may be 300 kilometers apart, and they may travel at 500 to 600 miles per hour. Even though they can keep pace with a jetliner, you wouldn’t see a tsunami from the cockpit of a jet. A killer tsunami may be only 2 feet tall in mid-ocean — far too small to be noticed from an airplane or even a ship, yet it can carry huge amounts of energy across the Pacific. In some earthquakes, the biggest killer is not the shaking, but the walls of water created by undersea earth movement. 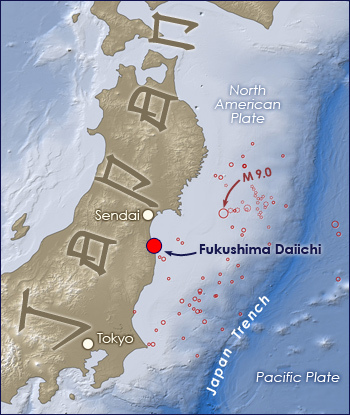 By Tuesday, tsunami damage had caused three reactors to explode. A fourth was burning, and stock markets were reeling. All that kinetic energy can hide in waves we can barely see because long-wavelength waves are extremely deep, and the massive amount of water moving beneath the surface contains enormous energy. In deep water, boats can ride the worst tsunamis without noticing them; but when they reach shallow water and “run aground,” these waves become dangerous. Like all waves, tsunamis slow when the lower part of the wave encounters the upward-sloping ocean floor. But while the front of the wave slows, the wave behind is still moving faster, causing a giant pile-up at the front, and the kinetic energy that was spread through the ocean depth concentrates in a towering wave at the surface. 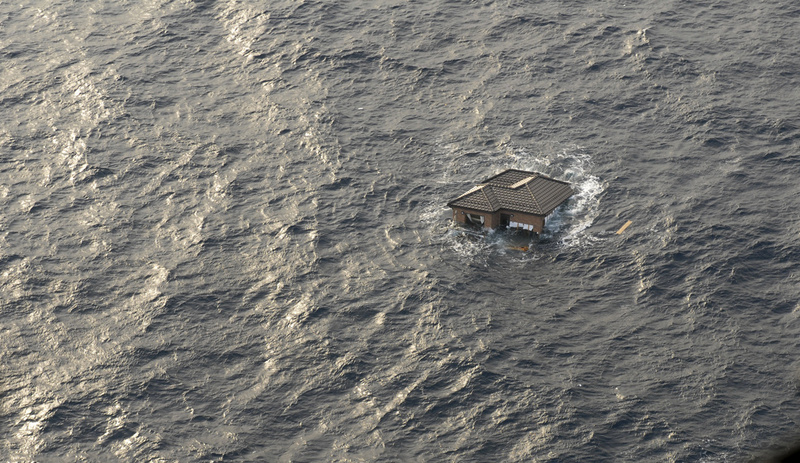 Tsunamis have other quirks. They can be spaced as much as one hour apart, so subsequent waves can kill those who return to help victims of earlier waves. A series of massive earthquakes levels Lisbon during the celebration of All Saints’ Day. Collapsing stone buildings kill thousands. As fires ignited by overturned candles ravage the city, residents seek relief from the heat near the waterfront. About an hour after the quake, a tsunami estimated at 50 feet tall sweeps in from the sea. The combined cataclysm kills about 60,000 people; only 15 percent of Lisbon’s houses remain standing. Krakatau, a volcano in the Sunda Straits, explodes with a gigantic roar audible 3,000 miles away. The explosions blow 20 cubic kilometers of rock into the sky. Undersea cracks allow massive amounts of seawater into a white-hot magma chamber. When the water turns to steam, the explosion causes tsunamis that cause most of the 37,000 deaths on nearby Sumatra and Java. Ironically, history’s most deadly tsunami is caused by a volcano, not an earthquake. 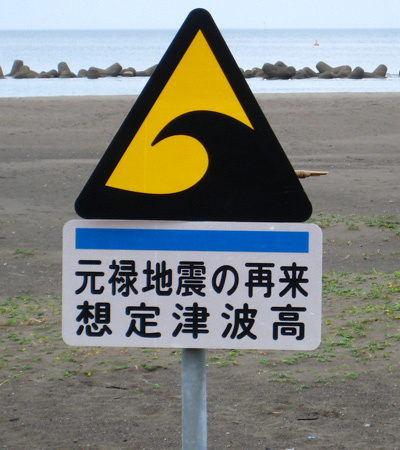 The Sanriku tsunami starts, as many do, when the sea withdraws with a great sucking and hissing sound. Striking a totally unprepared town during a festival, the wave kills 27,000 and destroys more than 10,000 houses. Fishermen at sea don’t notice the deadly wave and return to an ocean strewn with the corpses of loved ones and the wreckage of their homes. A large earthquake on Unimak, an island in the Aleutian chain, shakes the remote, steel-reinforced concrete Scotch Cap lighthouse, which stands about 100 feet above the North Pacific. Minutes later, a huge wave obliterates the lighthouse, leaving practically no trace of the five Coast Guardsmen inside. Five hours later, the tsunami slams into Hilo, Hawaii, obliterating the waterfront and killing 159. An astonishingly strong series of earthquakes in Chile — culminating in one of the three largest quakes in the 20th century (magnitude 8.9) sinks 300 miles of coastline into the sea, activates one volcano, devastates five provinces, and causes tsunamis that kill an estimated 1,000 to 1,500 people. Fourteen hours later, the tsunami arrives in Hilo. Ignoring warnings, many residents stay in homes near the bay, increasing the death toll by 61. Following a 9.0 quake off the west coast of Northern Sumatra, over 230,000 people perished in the Indian Ocean tsunami, which struck 15 countries. At the time, Indian Ocean nations lacked an ocean-wide warning system, causing the tragedy to strike without warning. Even a warning system would have had limited utility to close-in coastal communities, given the jet-like speed of the waves. The Pacific Tsunami Warning Center, established in Hawaii in the wake of the deadly 1946 tsunami, is a nexus in the global warning network. Since almost all tsunamis originate in earthquakes, the warning centers rely on data from seismographs, many of them located on the unstable ring of fire. In tsunamis, seconds saved can translate into lives saved. 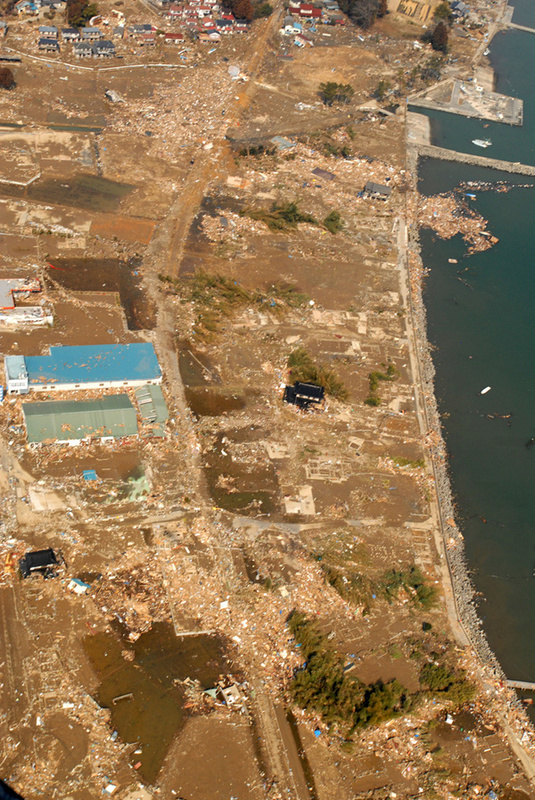 Tsunami damage north of Sendai, Japan. These large tsunamis come from a smaller break in the ocean floor, and so contain relatively little energy and do not travel well across the ocean, Newman says. But they also offer less warning because local people do not feel the massive shaking associated with a major tsunami. Newman and colleagues have developed software to detect the peculiar signature of the tsunami earthquake, and are now running it on a research basis. “We get an earthquake or tsunami warning within four or five minutes, our algorithm starts processing, and a few minutes after that, the system sends email to the Pacific Tsunami Warning Center and the U.S.G.S. [Geological Survey],” Newman says. 1. Be on guard for strong earthquakes, which can spark a tsunami. If you feel one near the water, run inland. 2. Heed the warnings, and stay tuned to emergency radio stations. 3. Never go down to the beach to watch for tsunamis — they move much faster than you can run. People die doing this. 4. Most structures in the danger zone provide no protection. However, the upper stories of tall, reinforced concrete hotels can provide refuge if you have no time to move inland or to higher ground. 5. A tsunami is a series of waves. Don’t go near the water until you hear the all-clear from emergency authorities. Seismologists are loathe to predict earthquakes, but in the past decade or two, they have recognized that earthquakes occur in series along major faults in Turkey and Sumatra, as big quakes place extra stress on the adjacent fault. In Sumatra, a violent series of quakes began in 2004 with a magnitude 9.1, a magnitude 8.7 in 2005, a magnitude 7.6 in 2009, and a magnitude 7.7 in 2010. Sinkholes: When the ground collapses!